Butterfly Pea Flowers (clitoria ternatea) aka Blue Pea Flowers have long been used in South East Asian cuisine. The flowers are widely utilised as a colouring agent for rice in Nasi Kerabu and Pulut Tai Tai (a glutinous rice cake) in Malaysia. It is fried in batter in Thai and Burmese cooking. The petals are also eaten raw in salads. 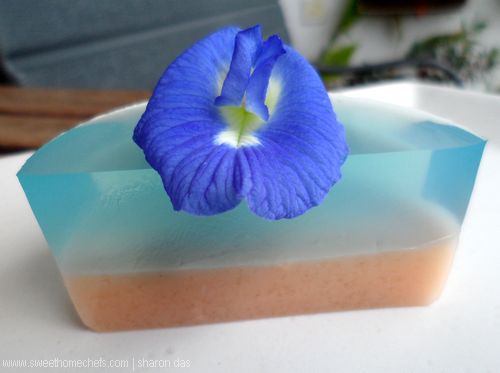 I decided to go with a beautiful agar-agar jelly for these freshly picked flowers. These lovelies are really easy to make. 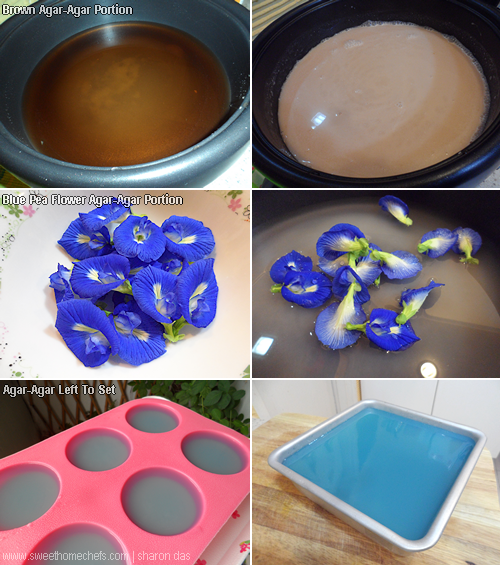 The basics - use two packets of agar-agar powder (one brown, one clear). Cook according to packet instructions. Colour one using blue pea flowers. Cook the brown one with coconut milk. Voila! Present with fresh edible butterfly pea flowers. Butterfly pea flowers are mildly sweet; I ate only the petals, pinching away the greens at the bottom. Fifteen of these flowers gave me a light shade of blue - I was worried that it wouldn't stand out, but it did! The colour became more obvious after it firmed on top of the brown agar-agar. I was so pleased with the results. It was a pretty combination. 1) Mix agar-agar powder with brown sugar. 2) Add water into a deep pan. 3) Stir the mixed agar-agar mixture and coconut milk in, and switch the heat on. 4) Keep stirring until it comes to a low boil and don't stop stirring until the mixture is well combined (sugar dissolved). Then, switch the heat off. 5) Let it cool a little before pouring the agar-agar liquids into moulds, at half full each. I used silicone cup moulds for some. It was very easy for me to remove the agar-agar here. The balance was poured into a square tin. 1) Mix agar-agar powder with sugar. 3) Stir in the mixed agar-agar mixture. Place the fresh flowers into the pan. Switch the heat on. 4) Keep stirring until it comes to a low boil and use your spatula to press on the flowers to extract the blue. Don't stop stirring until the mixture is well combined (sugar dissolved). Then, switch the heat off. Finally, take the brown coconut agar-agar out from the fridge. It should have settled into a jelly-like texture by now. Optional: Use a fork and gently poke some holes on top, or grate the set agar-agar a little. This is to help the second layer stick to the first layer. 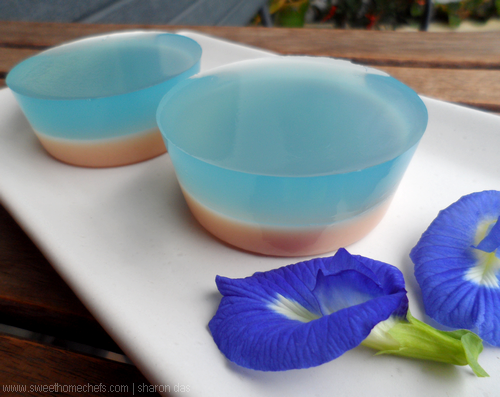 Pour the butterfly pea colour portion over the brown one, thereby filling the mould. Chill until firm! Enjoy! 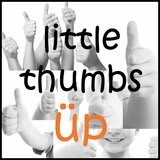 My family gave it a big thumbs up! 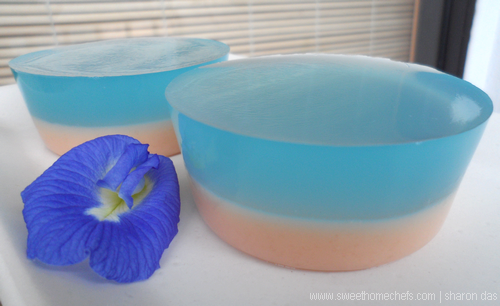 A big thumb up to Feb 2016, your pretty and cool blue pea flower jelly and counting down to CNY! I've seen people use this flower in asian recipes but I haven't got the chance to try it yet. This is such a pretty looking dessert! Thanks, Jasline. Even though these flowers are commonly used here, they are still hard to find! Those blue pea flowers are so pretty..totally love the dreamy blue colour. Oh yes, the colour was the first thing that made me fall in love with it. This a so cute...I love the blue color of it. Awesome dessert Sharon! The color blue is very inviting to eat. I love that dessert after eating plenty of rice! Yummmy! It's even very nice to look at! Good job Sharon!